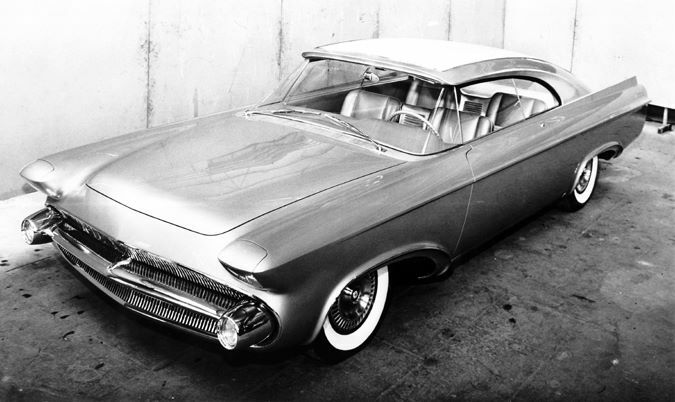 1956 Chrysler Norseman – A Specter from the Wreck of the Andrea Doria…. More than two-hundred feet beneath the Atlantic Ocean and deep within the darkened hull of the 697-foot long Italian ocean liner Andrea Doria lays the debris of what was once an experimental dream car. The ship sank several hours after being struck by the Stockholm on the night of July 25th, 1956. As a result, the unique lines of the Ghia-built 1956 Chrysler Norseman were destined never to be seen by those who designed it, nor were the spectators of the coming auto shows going to have the opportunity to ooh and ahh at the stylish fastback. The few people who did were the craftsmen at Ghia in Turin, Italy and possibly the people who loaded the car aboard the ship as well as some of its crew, or maybe not. That would depend on whether the car was crated or placed on a pallet as was customary for Chrysler’s other Ghia-built show cars. No one is absolutely certain of the method employed. It was probably in cargo hold number two, but even that is an uncertainty. Photographs of the car are rare. Evidently no color ones were ever taken resulting in conflicting information about its color scheme. Was it silver or green? We will probably never know. The few black & whites taken of the Norseman were done at Ghia shortly before the car was sent to the loading dock. The negatives for the interior photos seemed to have been lost and original prints are extremely scarce. This car was almost completely lost to history. There are a few facts about this sunken show car that have survived over the last five-and-a-half decades, though. The origin of the Norseman was sometime during 1953 in a studio occupied by imaginative stylists such as Cliff Voss, William Brownlie, as well as others along with capable engineers and managers who were all under the legendary leadership of Virgil M. Exner. (Coincidentally, the Andrea Doria went into service that same year.) The car’s name was derived from Exner’s Norwegian heritage. The team spent 50,000 man-hours and approximately $200,000 to design and build the Norseman. Ghia needed 15 months to construct the one-of-a-kind idea car. Arguably, the most unusual feature of the Norseman to emerge from Chrysler’s design studio was its cantilever roof. The Norseman is nearly unique in this regard since no production car and very few show cars have had this feature. Perhaps the concept would have been adopted for production if the car had not been lost. The lack of A-pillars gave an unobstructed view through the wraparound windshield; the idea had much appeal with Exner. According to his son, Virgil Jr., “He liked to provide good visibility in his cars.” There was more than good visibility involved in the design. Glassmaker, PPG, built the heat-treated structural windshield to make it more crash resistant. Furthermore, the roof was attached in tension to a ¼-inch rod located in place of where the A-pillar posts would normally be present. In theory, such a car in a rollover accident would be provided strong support; the retainers holding the roof and rods together were meant to shear thus releasing the roof from its tension state. Additionally, the roof had a couple of novelty features. One was a brushed aluminum insert and the other was a 12-square foot backlight that could be retracted forward into the roof via an electrical switch. This idea never went into production on any Chrysler product, but a somewhat similar idea – a backlight which retracted into the trunk – was used by Lincoln and Mercury. Fresh air intakes for the passenger compartment were located in the leading edge of the roof, too. Clamshell-type, hidden headlights and a full-width concave grille in combination with a thin bumper located along the horizontal center line and capped at each end with pod-mounted parking lights dominated the front-end view. All of it was finished with a valance panel sweeping underneath the assembly. The front fenders, with their hidden headlights, resembled the nose of a shark. The Norseman’s hood dipped sharply in front, leaving it beneath the frontal portion of the fender line. A light crease beginning at the top of the headlight doors gained prominence as it swept back to the rear of the car and actually formed a horizontal fin along the quarter panel. The fin on the driver’s side ended with the fuel-filler door. This set of fins – as did those atop the quarters – stopped several inches short of the rear of the car. The wheel opening were quite dramatic as well; they were low-cut in both the front and rear and each were scalloped similarly to those of Buick’s limited-production 1954 Skylark. Outside door handles were not employed. Instead, a push-button release not unlike those of the ‘40s Lincoln Continental was used. The rear of the Norseman was no less sensational. Other than its retractable backlight, this show car also featured elliptical nacelles housing chrome-plated bumperettes each with small, round stacked taillights. 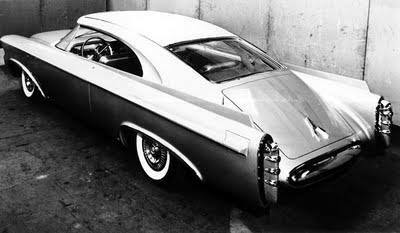 (A somewhat similar arrangement appeared on the 1957 DeSoto line.) The fastback roof flowed back so far it formed the opening for the center bumper. In profile the Norseman looked something like a rocketship from a contemporary sci-fi movie. Inside the Norseman were even more spectacular features. Its seating consisted of four power-assisted bucket-type seats covered in metallic light green leather with either contrasting gray or gray-green inserts. 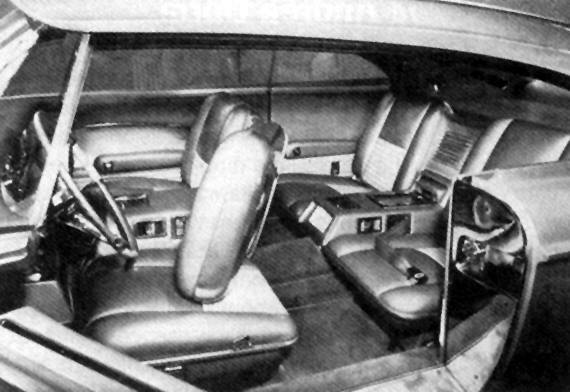 Each pair of seats was separated by a console with a glove box. Also incorporated into these consoles was a retractor for the buckle component of the seat belts; the other half of the reel-type seat belts retracted into the side of the front seats and probably the quarter trim panels in back. Interior lamps also appear to have been installed within the individual consoles. An experimental form of lighting was luminescent paint applied to the back side of the Norseman’s front seats. 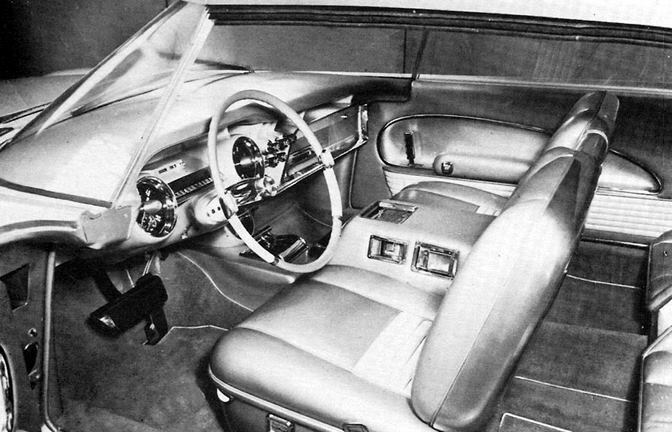 Instrumentation was suspended from the padded dash in pods and a small writing desk could be pulled out from underneath the passenger side glove box. Satin finish metal trim wrapped around from the door panels to the dash. While the outside and inside of the Norseman were flashy, the engine compartment may have or may not have been equally so. No photographs of it seem to exist to know if it was dressed up with chromed components though this was typical practice for Ghia. Regardless, the show car was reportedly fitted with a 235hp 331 Hemi instead of the high-performance version that was standard issue for the Chrysler 300-B. However, the car may have been refitted with the 340hp letter car engine if it had arrived at Chrysler. The Norseman’s chassis was a modified 1955 Chrysler type with a suspension of torsion bars in front and leaf springs in back. This is not often reported in other stories about this car, but Virgil Exner, Jr. believes this is true. His belief seems to be supported by a news article about the car published in the August 10, 1956 issue of the New York Times which quoted unnamed engineers as saying the Norseman had an “advanced suspension” but gave no other details about it. Torsion bars were employed for the 1957 Chryslers so the presence of the setup on the show car seems logical. 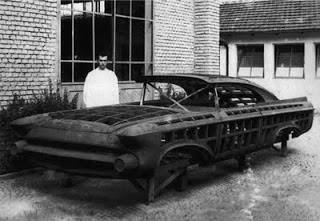 Other modifications included a wheelbase stretched from 126 to 129 inches and a full underpan to reduce air resistance underneath the car. If the Norseman had arrived safely, Chrysler undoubtedly would have thoroughly tested the car at its engineering proving grounds near Chelsea, Michigan before showing it to the public to gauge their reactions to the radical design. Brief consideration was given to having Ghia build a second Norseman, but the time needed to do this would have meant the car would not be available for evaluation until late 1957 or early 1958. Assuming the car was insured for its full cost, the money certainly would have been available for the project. However, the natural fast pace of the auto industry at that time would have rendered a second Norseman as obsolete by the time it was ready to be tested and shown. Hence, the idea was rejected. After 55 years under water, the Andrea Doria has deteriorated greatly. Its upper decks have collapsed over the years. Even if the Norseman had been so tightly secured as to stay in place even as the ship pitched over on its side and sank, it could not possibly have survived the years of exposure to the salt water of the Atlantic. Some reports claim the body was of aluminum. Virgil Exner, Jr. believes it was built of steel. Either way, the body would have corroded long ago. Chances are the car was crumpled as the ship flipped on its starboard side and struck the ocean floor. However, there are a few reports of divers spotting an unusual car within the ship. This, though, is rebutted by professional wreck diver and New Jersey resident, John Moyer, who has made over 100 dives to the Doria to recover artifacts from it. He has even taken some time to try to locate whatever remains of the Norseman, but never did. Unfortunately, there was little time to search. A diver is limited to 20-25 minutes to explore inside the dark and silt-filled hull of the ship. Complicating the matter of searching for the show car’s remnants is the tremendous amount of silt which can be stirred by the ocean currents at any given moment, rusted shards of metal which can tear a pressure suit, and the question as to where to look. The Andrea Doria’s manifest shows nine cars were placed in the ship’s garage, but whether or not that included the Norseman is not known. That means the garage as well as cargo hold two had to be searched. With the conditions within the ship Moyer could easily have swam past the debris of the show car and never known it. Even though the body of the car was not expected to have survived, parts such as the drivetrain and frame would be recognizable if they could be seen. Smaller cosmetic parts such as the unique wheel covers of the show car probably survived, too, as they are believed to have been chrome-plated brass. Interesting Post. It would have been nice if some under water Images could have been taken of the once great ship and what is left of this Classic car. Yes that it true, they believe it is in the garage or bay 2, not sure why pics were not taken on over 100 dives, but as you I wish they would have taken some.